Life is - a series of challenges, milestones and celebrations. The trick is to count our blessings and be thankful even when the roller coaster heads to a low point. After the Fall Paducah high.... this month has been a bit of a challenge. I was chased by some snapping dogs, fell off my bike, and tore my posterior cruciate ligament. Then in a full brace from ankle to crotch with no weight bearing for 2 an half weeks. I learned to hate that brace, especially trying to sleep at night. Thankful they didn't attack when I fell. Thankful for an amazing husband who has risen to the level of a Downton Abby butler. They finally allowed partial weight bearing on crutches. Did a lecture for the understanding and helpful Evergreen Piecemakers. Yay, a little bit mobile!! Then two days at the hospital with a two blood clots to my left leg and a blood clot to my lungs. Thankful the clot to my lungs was not much much worse. I personally have watched two people die of Pulmonary Embolisms as I held their hands. I will never forget them. Then - Grounded from my flight to the Houston show to join my dear award winning quilter and teaching buddy Kathy Wylie. OMG, you should see her new quilt - " All about Time" https://kathykwylie.com Blood Thinners for 6 months. Thankful but unable to happy dance when they announced Kathy and I had both won first places for our respective quilt categories. Celtic Fox looks so pretty in pictures people have been sending me from the show, bless you guys. Life experiences teach wisdom. Two of the biggest risk factors for blood clots are being over 60 and prolonged immobility of legs. Does that sound like a lot of us? I used to sit for hours sewing, waiting to get up, till I was likely to wet my pants. "I just want to finish this next unit". Even at the machine my right leg does the foot pumps to my pedal, while my left leg just dangles bent. WE NEED to get up at least hourly and walk around, do some foot pumps, and drink something to stay hydrated. I love you guys. Take care of yourselves!! Even though mine was provoked by my brace..... I intend to do what I can to prevent this happening again. I have posted on my website links to where I am going. Here are some open to public registration this coming spring. Sure hope we can meet! Quilting at the Lake, Lake Havasu, AZ. Click below for workshop project and registration information. MQX Quilt Festival. Manchester, N.H. 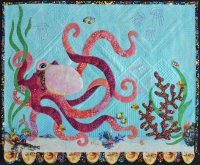 I receive letters all the time asking me for a pattern for "Song of the Sea" my Octopus quilt. It makes me sad to disappoint people but show quilts are generally too complex (hundreds of pieces if not thousands), too large to print (would be incredibly expensive), and I sell most of my quilts as one of a kind pieces of original art. Did you know that once you copy (pattern, print, giclee) a piece of art, the appraisal for the original goes down? That includes quilts. BUT... it is also such an honor that someone is inspired by or would like to make something that came out of my weird brain. 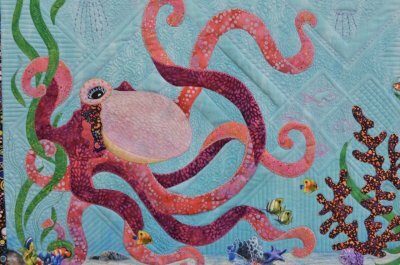 So I have made a wall hanging size Octopus quilt: Ophelia's little sister " Octopuses Garden". She, also, is full of joy and very playful. Listen to the Beatles song and decorate your own garden with shells, yarns, yo-yo's, novelty print fussy cut fish, etc. To purchase $13.95 click here. Tips for Quilting Modern- Usually I just outline quilt around all of my major shapes and then go back, within those shapes, to create more realistic textures or form. This girl, however, is Modern and playful, so I did something completely different. Modern quilters often overlap/go under and over major shapes. They add secondary geometric shapes that are filled with interesting patterns and textures. Those big extra shapes may interlock but frequently don't. Like with modern piecing, be improvisational. I just took my square rulers in a variety of sizes and chalked around them onto the background. Fill those with a variety of textures to make it more interesting. I used circular bubbles and straight line chevroning. This is a great pattern to practice your free motion quilting on. Secondary characters can be added if you use 40 weight threads in a contrasting color. 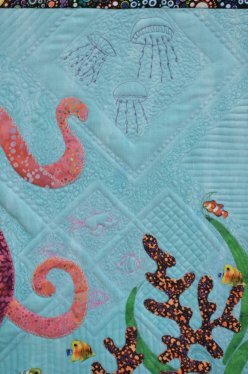 I added jelly fish and drew some for you that come with the pattern. I am so thankful for all of you who share my joy and passion. Thank you those that follow me on Facebook and sent - Get better and behave yourself messages. Have a wonderful Thanksgiving and I will touch base before Christmas with a little surprise.